Have you ever made an I Spy quilt? Have you wanted to, but were daunted by the idea of collecting all those different novelty fabrics? With an I Spy quilt, the more different items you can spot on it, the better! Well, here’s your chance to make a great one… we’re hosting an I Spy Fabric Swap! You send 200 squares of fabric of 10 different prints. You get 200 squares of fabric back of 200 (mostly) different prints. It’s possible that you will get some duplicates but most of your squares should be different. Here’s the details . . . . .
Cut 20 4″ squares from each of 10 different novelty prints. The 4″ includes the seam allowance. Make sure the “I Spy” object will be visible in the 3.5″ center of the square. You should be able to get 20 4″ squares from a quarter yard of fabric. Mail your 200 squares (when you comment we’ll contact you with the address). Include a self addressed stamped envelope with the same amount of postage it cost you to mail the squares to us. …will take all the squares, give 1 of each print to the other participants, and one to you. After this is done for each participant you will have 200 squares in your pile. Then we’ll mail your 200 squares to you. Pick fun fabrics… something you would like to have. Quilt shop quality only! Make sure it actually has an object to “spy”….. floral fabrics don’t work, but a fabric with a flower does. Make sense? Be accurate with your cutting. Mail your squares by October 25. We’ll mail them back by November 5. You should have plenty of time to whip up an I Spy throw quilt – or some other I Spy project – for Christmas. As long as your fabric is quilt shop quality, it can be from anywhere (including your stash! 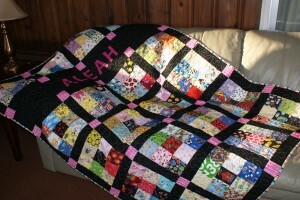 ), but if you would like to purchase it from Quilters Warehouse, we’ll give you 10% off your order of novelty prints. Use code: greatfabric10 at checkout. Coupon is good until October 25, one time use, for any fabric except Bargain Bin. The first 19 people to comment are IN! Lindsey, are you joining in? If so, please comment again and leave your email address. Thanks! If there is still time , I would love to participate… My first grandchild is 3 months old and this would be perfect for him! I want to join the I Spy Fabric Swap! I would love to join in on this as I am collecting different fabrics to make quilts for children then I donate them to children in need or who are in the hospital long term. I would like to be involved in the “I Spy” fabric swap. Julie, please leave another comment and include an email address in the form so we can contact you. So glad you are joining us in the swap!